Now that I’ve discovered that Norton has a deep and abiding love for Elmo, toddler toys for Christmas became significantly easier. In fact, it’s safe to say that I am currently done shopping. Or at least, the husband has decided that I’ve bought enough toddler toys for Norton’s Christmas and it’s time to stop shopping now. Boo. I haven’t even put up a Christmas tree, and he’s already telling me to stop shopping. Because Norton finally likes something and I can identify it without watching him for a reaction, Norton is getting a Christmas that’s a bit Sesame Street influenced. 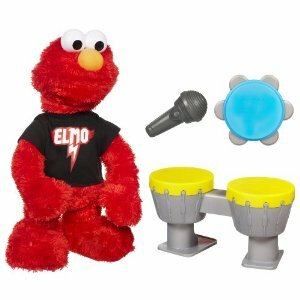 Sesame Street Let’s Rock Elmo – I wasn’t going to buy this toy. I thought that it was overpriced and because it sings and dances, it will not be a cuddly toy and will probably be forgotten about. It seemed like an awfully expensive thing that would be forgotten about in a couple of weeks. Then I saw the Sesame Street Let’s Rock Cookie Monster Keyboard. I knew without a doubt that Norton would enjoy the keyboard. He’s already showing a preference for musically based toys. When I found out that the keyboard integrates with Elmo, I was sold. I had to make sure that Norton had it. So I’ve bought Norton the keyboard and Elmo, and I’m hoping that they’ll be a big hit on Christmas morning. At the very least, he’s extremely fascinated with Let’s Rock Elmo when we push the demo button in the stores. That’s always a good start. 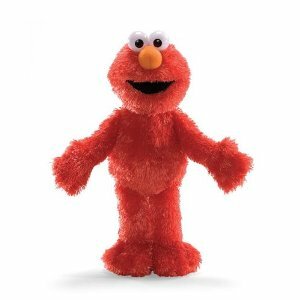 Gund Teach Me Elmo - 15.75"
Gund Teach Me Elmo – When I was a little kid, I had a Snoopy doll that was designed to teach little kids about dressing. It had a buckle, a button, a zipper, Velcro, and a lace up shoe, all meant for me to play with and figure out so that I could do those things myself. (It took a long time to figure out the lace up shoe part, though… but that’s probably the subject of a childhood trauma blog post or something.) I loved the toy and I loved zipping and unzipping Snoopy’s jacket. I really, really wanted Norton to have something similar. Plus, he’s so darned independent that he wants to do everything for himself. I figured it made far more sense for me to provide Norton with the means to figure these things out instead of getting frustrated. So I went ahead and ordered this for Norton. Since it doesn’t come in a box (Gund toys don’t), I’ve decided that Santa will bring this to Norton. 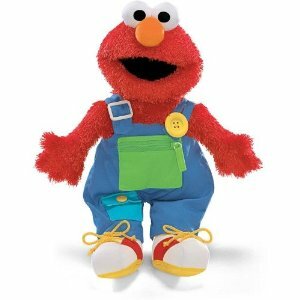 Gund Sesame Street Elmo Plush – This Elmo does absolutely nothing. It does not sing. It does not dance. It doesn’t have buttons to fasten or zippers to zip. It’s just a cute little stuffy, and at 13 inches, I was hoping that it would be just the right size for cuddles. Now that I have it, it’s definitely soft, cute, and adorably cuddly. However, I probably could have safely bought the 15 inch high Elmo Plush and it probably would have been a better snuggle. Anyway, the plush Elmo will also be from Santa because of the lack of packaging. Hopefully it becomes something awesomely cuddly in his new toddler bedroom. I loved my little doll that taught me about getting dressed. I hope Norton enjoys his new Elmo too!